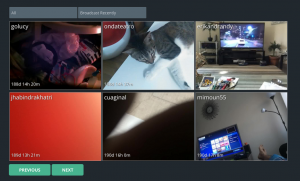 For such project you can’t use plain ppv videochat scripts because these work only with webcams (connected to performer’s computer) and require performer interaction on paid shows. You need a special solution that works with IP cameras, broadcasting 24/7 without performer presence and interaction from computer. IP camera re-streaming requires Wowza RTMP hosting on same server as web hosting. s2Member plugin to enable paid membership (in example require a certain paid membership for accessing certain channels). FREE for use with PayPal & Paid mode available with more gateways and features. Paid Membership plugin allows membership based on credits (use same billing system for tips, content purchase, membership). FREE. Mobile App: If you want to use mobile devices for broadcasting, instead of IP cameras (great for broadcasting from other other locations, hotels, vacations), contact VideoWhisper for developing a custom site iPhone / iPad and/or Android Live Streaming Application . Video Share VOD – Publish previously archived videos (in example from live streams), upload, convert. Supports adaptive multi bitrate streaming, membership access, VAST support for integrating popular video ad networks. These solutions can be used in combination with Broadcast Live Video site software because all use same framework (WP).